Videos, worksheets, games and activities to help Algebra II students learn how to convert from degrees to radians and from radians to degrees. 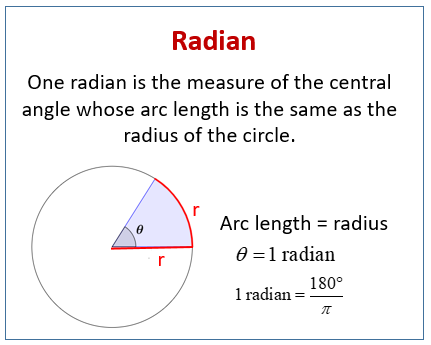 One radian is the measure of the central angle whose arc length is the same as the radius of the circle. The following diagrams show what is a radian. Scroll down the page for more examples and solutions. What is the relationship between radians and degrees? This lesson discusses radian measure and how it relates to measuring angles in degrees, leading to converting between the measurement systems. There are also a few examples involving measuring angles in radians. Converting radians to degrees and vice versa. Converting degrees to radians in geometry comes down to multiplying by an appropriate conversion factor.